Usually architecture that surrounds us is static – to accommodate change, buildings are either reconstructed or demolished. Generations of architects and engineers have dreamt about buildings and structures that can physically react in order to quickly adapt to varying needs or circumstances by changing the physical shape, spatial and functional configuration, levels of natural and artificial light, overall aesthetic appearance, etc. Yet, until very recently, most of these visions have hardly been realized, primarily due to financial and technological limitations. Those that had been built were usually limited to small scale experiments or highly visible, high budget projects. Whereas the development of a robotic architecture appears still many years away, there is a promise of significant progress in digital display technologies, which allow patterns, images, text, etc. to be mapped onto building’s surfaces, thus changing its appearance. Regarding the enormous creative potential that these new technologies offer it is not surprising at all that the vision of so called “media façades” has for many years inspired architects in countless competition entries and building proposals. Though, till today, hardly any of these visions have been realized; mainly due to the enormous budgets which are still necessary to integrate state of the art display technology at a relevant scale, but also due to serious conceptual deficits. As the technological progress continues the question of why and how to apply such type of technology to buildings needs to fall back into the realm of architecture. Because the definition of the relation between a building and its outer surface is one of the oldest and most essential aspects that define architectural thinking. Today, as soon as a building façade becomes a “media façade”, the architect usually looses control: especially digital commercial billboards constitute powerful economically independent modules exclusively programmed to generate money by selling broadcasting time. Such global commercial or political messages do not generate any form of relevant relation between the specific building and its outer appearance. The surface of the building becomes separated and alienated from its inner structure and processes. In other words, the widespread ambition to equip buildings with media surfaces and the available concepts for content do not match. The industry’s desire to conquer architectural surfaces turning them into advertising billboards is just one aspect of the problem. Either architecture will expand and take control of the new medium, or other design disciplines will take charge of tomorrow’s facade designs. In order to avoid an architecture without characteristics as ironically envisioned by Robert Venturi’s and Denise Scott Brown (“Viva the façade as computer screen! ... Viva iconography – not carved in stone for eternity but digitally changing for now, so that the inherently dangerous fascist propaganda, for instance, can be temporarily, not eternally, proclaimed!”) we need to elaborate clear positions on the subject and to develop fundamental design approaches. We need valid dynamic aesthetic and cultural conceptions – choreographies – as a continuation of an architectural culture that took centuries to evolve. We have been researching appropriate formats and environments to test the aesthetic and conceptual potentials of fusing architectural spaces, digital information and communication since 1997. As part of this design research we had the chance to realize two of the world’s largest “media facades” which we believe to have the potential to serve as reference projects in the discourse about dynamic architectural surfaces. 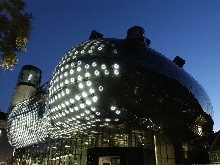 BIX is an award winning light and media installation for the Kunsthaus Graz, an international exhibition hall for modern and contemporary art. BIX transforms the building’s main eastern façade into an alterable, performative membrane to transmit internal processes of the art institution into the public. Beneath the acrylic facade facing the Mur river and the city center, we deployed a matrix of 930 fluorescent light rings covering an area approximately 20 m high and 40 m long. Each light ring acts as a giant pixel, whose brightness can be computer controlled and infinitely varied at the rate of 18 values per second. 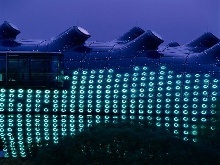 In this way, low resolution light patterns can be generated over the entire façade and be visible from a considerable distance all over the city. The “resolution” of the matrix is extremely low. There are only 930 pixels – a mere 0.2 % of the pixels found in a typical TV screen. In addition, they are monochrome only. On one hand, such a low image resolution imposes strong limitations; on the other, however, it enables both the modular structure and the large size of the installation to be highly integrated into the architecture. 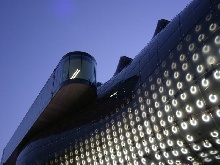 Not a separately mounted video wall but the Kunsthaus itself radiates characters and images; the projection and the building achieve an extremely high level of integration as a single entity. 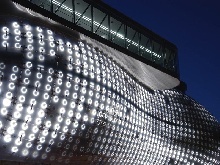 The 930 lights of the BIX installation seem to be “tattooed” onto the skin of the building like individual spots of pigment. Since its inauguration BIX still is one of the world’s very few large scale, permanent urban screen installation, run by a non-commercial entity and exclusively designed and dedicated to show artistic productions. Due to the comparable low price for building the BIX installation any pressure to refinance the technical investment by selling commercial broadcasting time, i.e. 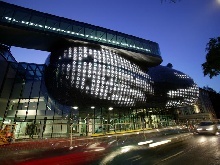 forcing the Kunsthaus to screen commercials on its façade, could be avoided. 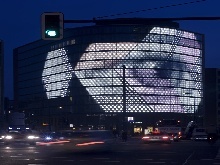 The SPOTS light- and media installation is a large scale public communicative façade membrane at Potsdamer Platz in Berlin which was inaugurated in November 2005. 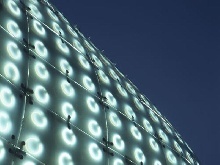 SPOTS comprises a light matrix of some 1,800 ordinary fluorescent lamps that is integrated into the ventilated glass facade of the existing building at Potsdamer Platz 10. A central computer linked to a bus system can control all of the lamps individually, adjusting their brightness or switching them on and off. 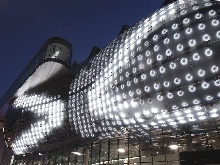 As a result, designs, graphics and animation sequences can be recreated on the facade as moving luminous images. An artistic programme implemented in a series of curated exhibitions was initiated as a base for the installation’s necessary qualitative ongoing performance. One of the given premises was the client’s wish to finance the artistic works/ exhibitions by displaying sponsor messages. Therefore we invented the M-Monday system creating a clear division between showing artistic works from Tuesday to Sunday and using Mondays as an ‘exhibition-free day’ to display advertising. With the ongoing technical progress in the field of digital display technology – in combination with dropping cost – media façades will become a widely spread phenomena throughout our cities. In this imminent transformation of architecture which is becoming a performing actor we start to realize that we are missing convincing architectural concepts not only for the design of media façades but especially for the design of the content to be shown. We have learned that the usual parameters and criteria for the evaluation and the design of conventional display systems cannot be transferred to the new architectural design task. Yet we know that it is important to understand that these projects “just” mark a starting point for a long development still to come. In 2000 the brothers Tim Edler and Jan Edler founded realities:united, a studio for art, architecture and technology. realities:united develops and supports architectural solutions, usually incorporating new media and information technologies. One major focus of realities:united is architecture’s outward communicative capacity. Although the majority of the projects incorporate new technologies or experimental approaches in one way or the other, the work always aims to affect actuality, not virtuality.